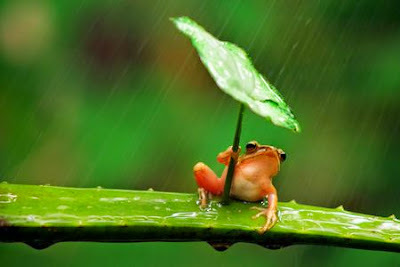 I'm not sure how often frogs need shelter from the rain, but these photos inspire a bedtime story, I think! They are vertebrates, so they have a backbone, but they are cold-blooded, or ectothermic -- their body temperature is controlled by their environment. They live near water or swampy areas, and they normally lay eggs in water. Many "drink" water and absorb important minerals through the skin. They can also breathe through their skin, as well as their lungs (in adults) or gills (in juveniles). 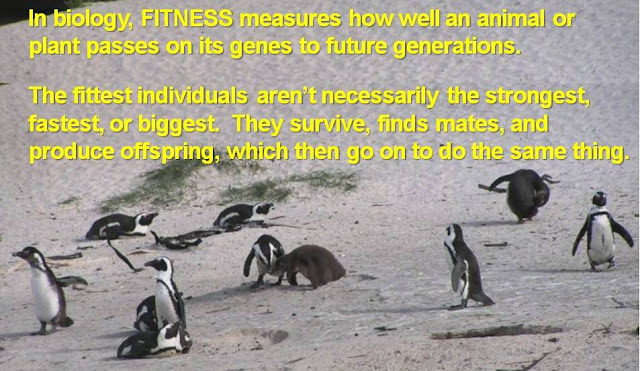 The sensitivity and permeability of their skin has allowed them to survive alongside bigger, stronger animals because they use habitats that others can't. Survival by full lifestyle change. 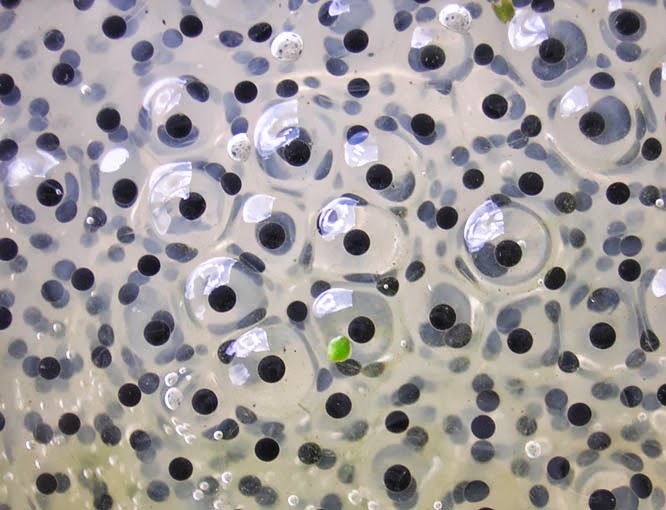 But this same permeability and sensitivity make frogs and toads particularly vulnerable to environmental threats. The skin of amphibians protects them from some parasites and diseases (and some have toxic substances in their skin), but it also takes in pesticides which are proliferating in wetter environments. They are like the "canary" in the coal mine - succumbing to toxins and disease earlier than most other plants and animals. 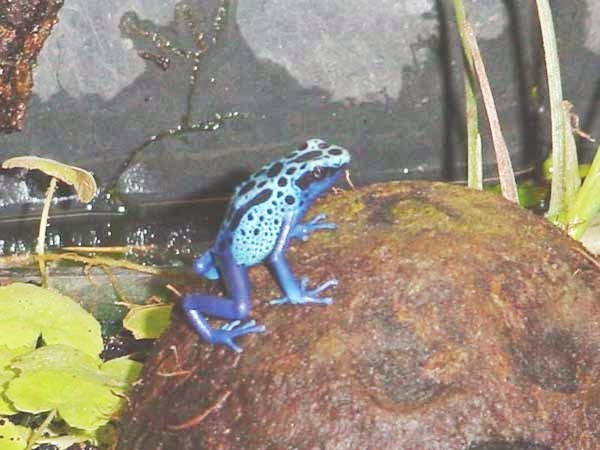 The deadly chytrid fungus harms frogs by thickening their skin and making it slough off. Infected frogs lose electroytes and die from cardiac arrest. The fungus has been disastrous for frogs, destroying or decimating over 200 species of them. 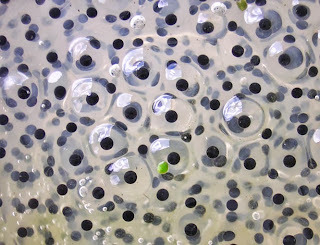 Frogs start off as eggs, and they live in water as juveniles (tadpoles! ), then metamorphosize (change shape) into the 4-legged jumpers you can see in the nearby swamp. Adult frogs and toads have 4 legs and are great jumpers, but they have no teeth and can't chew, so they eat their food -- usually insects -- whole. Amphibians can survive partly frozen during cold winters. 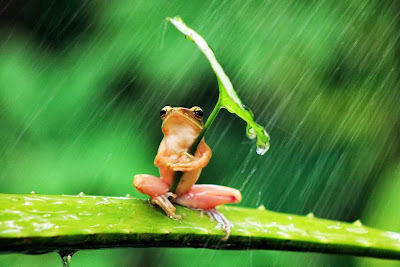 Click here and here for how you can help frogs.